One of the best purchases I have made to benefit my health was not a gym membership or diet supplement, it happened to be a vegetable spiral slicer. If you consider how easy it is to come home and make a big ol'pot of spaghetti noodles (and have left-overs for days), you can understand why I had to solve this problem. A spiral slicer allows me to make "noodles" that carry more nutrients and more flavor. These noodles, that are often called "zoodles" are made by taking a vegetable and cutting it in a way that makes a thin spiral noodle. Sure, these alternatives take a little getting used to, but once you find the right recipes (like this one), regular pasta will even downright disgust you. Spiral slicers can be found fairly inexpensive such as this Maxam Stainless Steel Vegetable Spiral Slicer. There are also high-end, top-notch spiral slicers such as this Commercial Grade Spiral Fry Cutter. The primary one will suit just fine for everyday cooking and similar ones can be found in many kitchen stores and online retailers alike. Now let's get down to the nitty-gritty. Once you have your new pride and joy spiral slicer. You're going to want to make this recipe. Chinese Five-Spice invigorated the senses by balancing all tastes of the palate: sweet, salty, bitter, sour, and pungent. 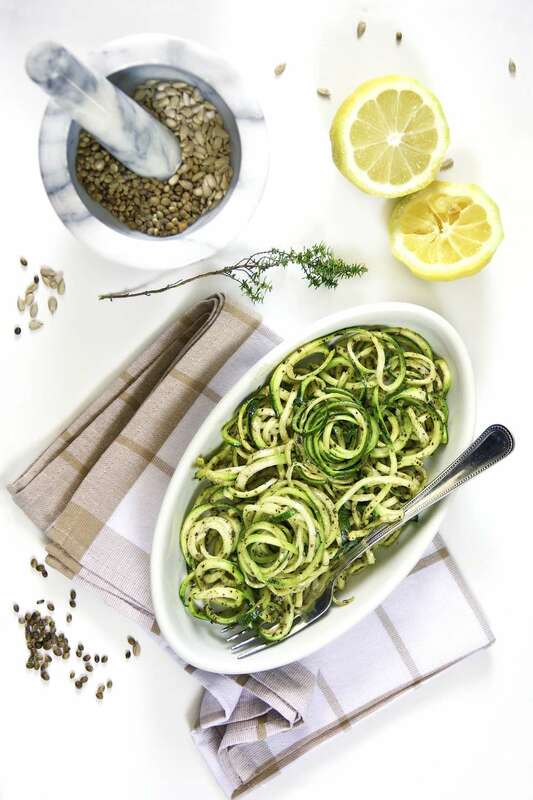 Combined these perfectly balanced flavors with some zoodles and chicken and you have the perfect lunch, dinner, or late night snack. It is important to start with the dressing so that zoodles do not sit and become soft or discolored. In a medium mixing bowl, combine apple cider vinegar, olive oil, and all of the ground spices. Whisk together or use an immersion blender to combine the vinegar, oil, and spices so they make a well-mixed dressing. Set aside as you prep the rest of your ingredients. Once you have the prepped chicken, zoodles, carrots, and cilantro ready place inside the mixing bowl and toss together so the dressing lightly coats the zoodles. Transfer to a serving dish or bowls and then garnish with sliced almonds. Eat and Enjoy! Storage: Zoodles will not keep the same texture cold for very long. While it can be stored in an airtight container in the refrigerator, to eat later I suggest heating the mixture with a little olive oil (or coconut oil) in a skillet on medium high heat and make a zoodle stir-fry.